The Splendid Table often features interviews with chefs or other figures in the culinary world, and one of my favorites was with chef and food writer J. Kenji López-Alt. Lopez-Alt is the managing culinary director at Serious Eats and author of the award-winning The Food Lab, a cookbook on better home cooking through science (something I plan on buying since this is RIGHT up my alley). The interview focused on Lopez-Alt’s article for Serious Eats titled “It’s Always Morning Somewhere: My Favorite Breakfasts Around the World,” a global tour of his favorite breakfast foods. 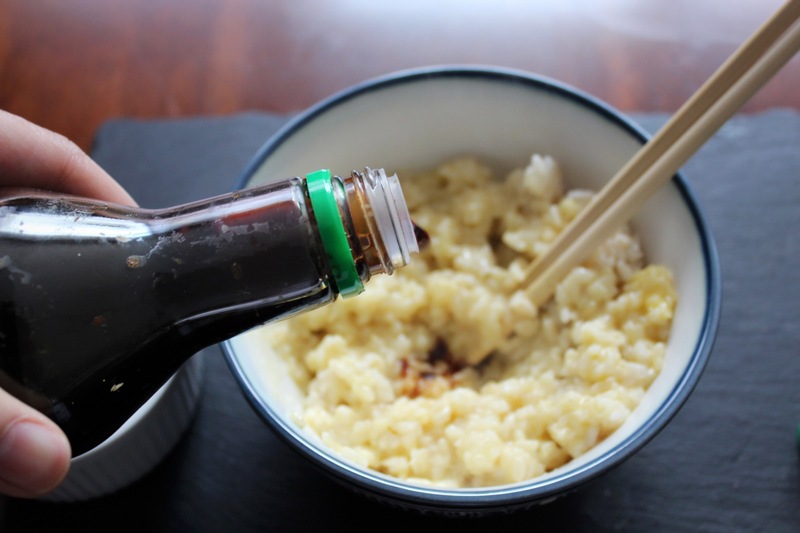 One dish that caught my eye was tamago kake gohan / tamago gohan / TKG for short, a simple Japanese-dish that consists only of an egg whipped around hot rice with a few extra additions. Lopez-Alt describes this dish as one of the first-recipes he learned, and “Japanese comfort food at its simplest.” I wrote a post on my Instagram a few days back, discussing comfort food and how it serves as the closest thing we have to a time machine. No matter how simple comfort foods are, they are often the closest to our hearts. Funny enough, the post discussed an article by Francis Lam, who happens to be the new host of The Splendid Table! This recipe looked simple enough, so I decided to try it out. I followed the recipe from the article in the paragraph above, but just in case you’re lazy, I’ll embed a YouTube video here as well. Disclaimer: Consuming raw or undercooked meats, poultry, seafood, shellfish, eggs or unpasteurized milk may increase your risk of foodborne illness. Take the egg and pour it over the hot rice (if you’re not sure it will scramble well, you can pre-scramble it in a bowl before adding it). 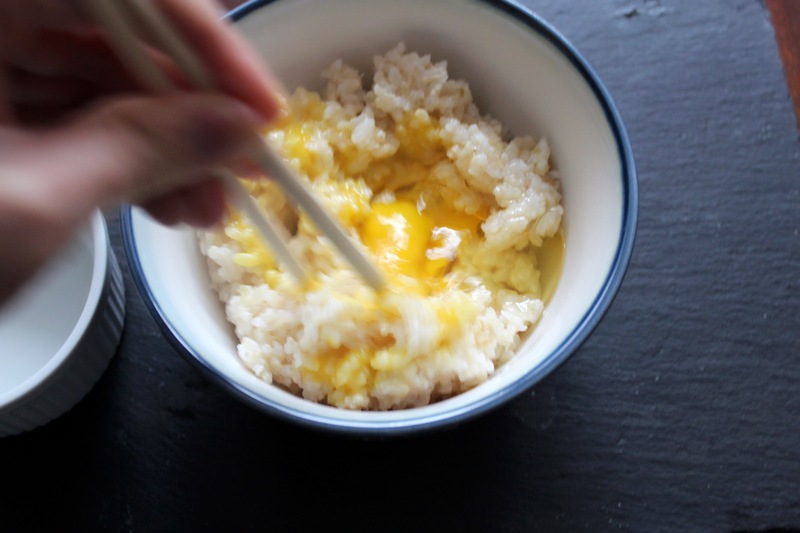 Keep scrambling with your fork or chopsticks so that each grain of rice is coated, the hot rice will cook the egg. The key is to incorporate lots of air into your mixture so that it is frothy and has a consistency similar to a risotto. At this point, I added a few splashes of soy sauce to taste, you can always add more later. After stirring the soy sauce into the rice, I added a few dashes of furikake. This particular blend had big bonito flakes in it, but I also have one with wasabi. After mixing in the furikake, I added a little more on top and then added the yolk of an egg for extra richness. If you haven’t tried it before, the water bottle-egg yolk trick actually works. What’s your favorite comfort food? What dish brings you back to your childhood? Let me know in the comments below or on my Instagram! That looks SO DELICIOUS. By the way, I am in love with your signature. So clever! It was really good! And thanks so much, I chuckled when I first made it!